I must alert you do you smell something in the air? If the answers No, good. As that could be a sign that the myth of the Skunk Man is real, his presence is known by a skunk like smell. A legend or a myth, be he what you please, he is a character that Lansdale has created in this story of fiction. He certainly adds a thrill to the tale. Skunk man presents death, a bogeyman like character that one shall tell tales of and our main characters in this story hope to be not true. Sue Ellen a young woman, sixteen years old, she is a gem of a gal a diamond amongst the rough. Lansdale writes through her eyes, he walks you through her thoughts and uncensored point of view of her harsh and brutal environment. I loved her humorous thoughts and insight.With might and main Sue Ellen and her companions will embark on an journey an odyssey of survival and endurance. They need to do a deed out of goodness of their hearts to a departed soul a soul that was young, talented and beautiful whom died under queer circumstances. Also an important reason for their journey is to escape from brutal hands of evil that men do. A window of opportunity opens up along the course of things, that present a chance of bigger pockets, happier hearts and greener pastures. The other equally wonderful character and gal is Jinx a young black girl who is full of courage and heart, needed in the by gone days of the deep south. Sue Ellen’s mother is a woman who needs to wise up and take care of her daughter her problem is most of the time, when at home with her husband, shes under the influence of an alcoholic concoction called Laudanum. Lansdale writes with realism of the South, with a prose that’s has vigor heaped with heart. He immerses you into the heart of darkness with characters that pack plenty heart and gusto. These characters are a rare occurrence to find but when you do you should be the best of friends, ones you could trust your life with. What presents for me great story telling are character’s that leave a mark, coupled with clear and simple writing packed with realism. Joe R. Lansdale remember his name because he is about to break down genre barriers and surpasses tags of fitting into certain book readers categories. A book for both the male and female reader alike that will make a mark on all ages down to young teens as a must read for 2012. This is definitely one to make my best of published work in 2012 list so early on in the year. 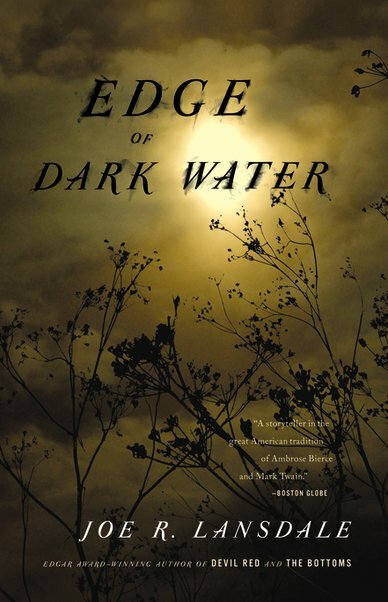 A river story that once you embark upon the tale you will not want to finish and gone on and on until the sea ends. A story to savor and cherish. Don’t miss it preorder it now. Many thanks to Mulholland books who have provided so many great works of literature and hours of thrill.